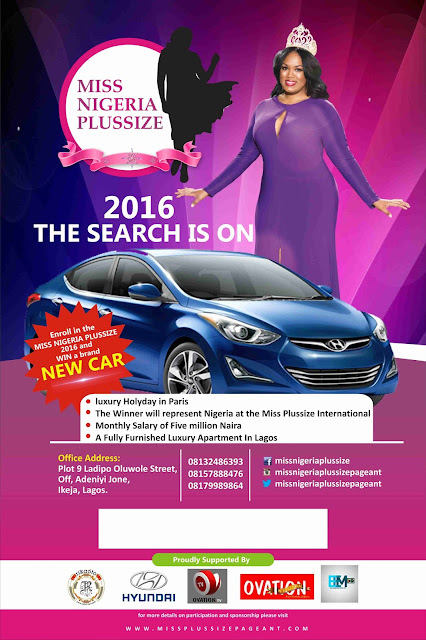 The Miss Nigeria Plus Size Pageant has started its 2016 call for entries. Are you a lady of full figure, intelligent, a Nigerian between 18-26 years old. This is your opportunity to get crowned as first ever Miss Nigeria Plus Size edition. The winner will walk away with five million naira total salary paid in monthly installments and a brand new car. The chosen queen will also represent Nigeria at the Miss Plus Size International pageant. To participate, pay N5,000 to the Miss Nigeria Plus Size Pageant Account (0176505081 at GT Bank). You can also proceed to Plot 9 Ladipo Oluwole street off Adeniyi Jones, Ikeja, Lagos to obtain your forms. *This is good, not only Lepa people can participate in beauty contests.